The waistcoat for the DPP is finished. Here’s a recap of some of the steps along the way. First the pattern was drafted, mocked up, and fitted. Once the pattern was right, I started arranging the embroidery files to fit the pattern exactly. I ended up using a sprig and rosebud as a border, with a double row of chain stitch along the edge. Pockets and pocket surround patterns were more elaborate, using sprigs of greenery and open roses to fill out the pattern. 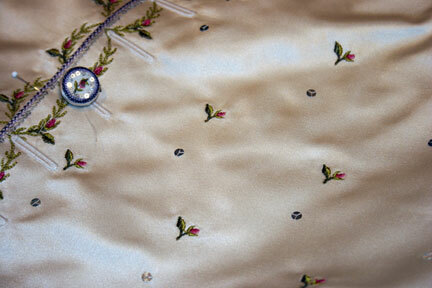 Once the embroidery was complete, spangles were sewn alongside the double line of chain stitch, and smaller pieces like the pocket flaps and collar were assembled. Pocket flaps were then sewn on to the waistcoat fronts. Waistcoat parts waiting for assembly. Buttons being spangled before being cut and assembled. 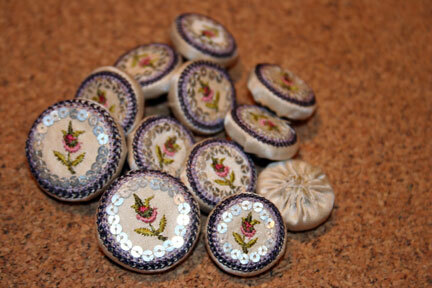 Waistcoat buttons ready to be sewn on. Then everything gets sewn together. The waistcoat was backed and interlined with a plain, natural colored linen. The fronts were interlined with more linen, and lined with a natural silk taffeta. 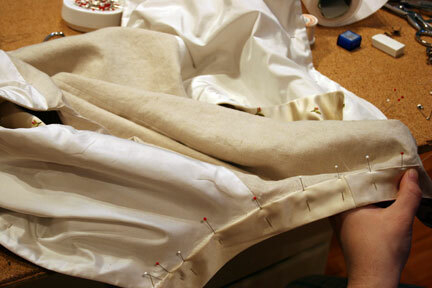 Most of the seams were sewn by machine, but the final seam along the neckline was finished by hand. Finishing the neckline by hand. 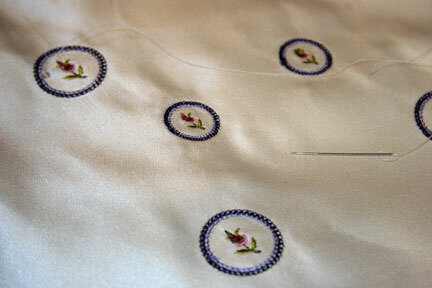 The last steps are to make the buttonholes (always a bit scary), mark button placement, and sew on the buttons. An underlap was added during patterning so that the waistcoat edges would meet exactly when buttoned. There were a couple major setbacks on the waistcoat. The first one came while stitching out the embroidery for the waistcoat fronts. 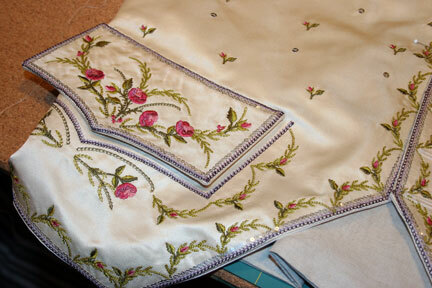 The pattern was broken up into pieces: 3 sections forming the outline of the waistcoat, a fill of small flowers for the body, and the pocket flap surround. I’d stitched each section individually and together, on muslin, using the same colors or very similar colors. I liked the combined effect of all the parts, right until they were all embroidered on the satin. Uh-oh. 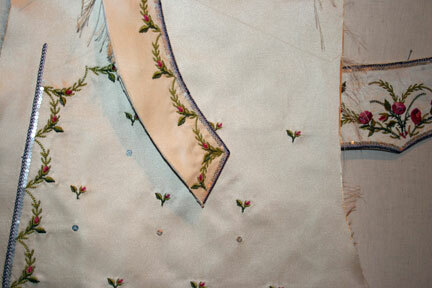 The floral sprigs I was using as the fill on the waistcoat chest area had problems. Even though they were the same threads used everywhere else on the project, these particular flowers seemed to emphasize the darker green stems and medium pink buds, rather than the lighter greens and pinks in the waistcoat border. They just seemed really dark in comparison. Also, the floral sprig being used, while from the same set of patterns and originally used together on a period waistcoat, just felt like they were too different from the roses and buds used elsewhere. And finally, once it was all together it was obvious that the buds were too large, and placed too closely together. I went from being totally in love with the project when just the border was stitched, to hating it once the fill was added. It was hours and hours of work, never mind the expensive materials. The question was – do I feel strongly enough about it to start over? This was the time to make the decision, before I put any more work into it. After a cup or tea and a chat, I decided that yes, starting over was exactly what I needed to do. Rosebuds pattern filling the chest area. The second setback came when I was about to cut the embroidered and spangled waistcoat fronts for assembly. From looking at multiple period examples, it seemed that most of the waistcoats did not have an underlap for the buttons; they simply overlapped and part of the embroidered was covered up when buttoned. I wasn’t 100% happy with the idea, but it was period and it saved time (and money), since the side of the waistcoat that would be hidden would not need spangles. I kept wondering if it was the right decision, and with 2 fully embroidered waistcoat fronts laying in front of me it was finally clear: I needed that underlap. When the two sides overlapped, the embroidery on the right was almost completely hidden. Period or not, it just looked unbalanced. I had enough seam allowance to create an underlap, so a quick pattern change was all that was needed. Well, a pattern change and a few more hours sewing on more spangles. In the end, I am very glad I took the time to re-do those steps. I absolutely love the way it turned out. It really shows off the embroidery and hand work that went into it.